The bodies of the two nuns on Taylor Street we spoke of in our recent entry aren’t the only bodies in Chicago reported to have turned to stone. Another was found on the beach in 1893. 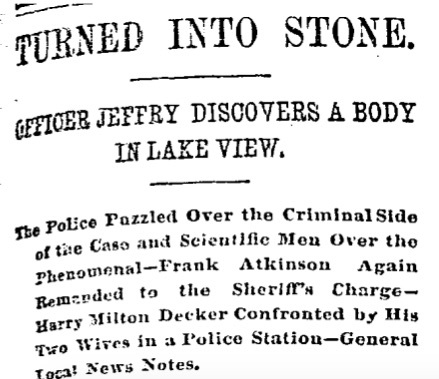 When Officer Jeffry was making the rounds along the beach near Hollywood Avenue in April, 1893, he came upon a ghoulish find: the dismembered torso of a woman, half-buried in the sand. The arms were fully severed, along with the head. Part of the spine and thigh bones protruded from the torso, one all the way down to the knee joint. Some of the flesh was blackened or missing. But what remained of the flesh appeared to stone. Some papers said it was as white as marble, others described it as gray, but all agreed that when tapped, it made a hollow, hard sound, as though someone was tapping a hollow tree or a papier mache cast. Only a faint odor of decay was present. Morguekeeper Sanders had never seen anything like it. At first he speculated that the had been killed by a propeller, but the dismemberment was fairly neat – the head and arms were completely gone, the legs hacked off above the knee. Also, it would have had to happen back in the fall, when boats were still navigating the lake, and the body probably would have decomposed far more in warmer water. One officer suggested she’d been killed with arsenic, since arsenic could preserve bodies. Others guessed she’d been weighted down in icy water that kept her frozen. The Times suggested “perhaps after all it is the work of those ghoulish jokers, the medical students. The adolescent scientists who spend their nights smoking big pips and clawing into unpleasant corpses do such things as this sometimes. It is a great joke for your medical students to drop a scrap of a corpse in the street or some out of the way place, hoping thereby to create stir of a mystery.” One person at the morgue did say that perhaps it had been a medical cadaver from one of the universities that had been dissected and kept in a “pickling vat,” but that traces of the knife had been removed by the water. .
Several hundred people, according to the Times, came to the morgue hoping for a peek, and were disappointed that it was not on public exhibition. On April 8, an inquest was held and attended by around 20 doctors. They all agreed that the seemingly-stone body was not “petrified” so much as “preserved” in a natural process in which “minute particles of sand” were ground beneath the skin, making it as hard as rock. (I’d love it if anyone with scientific knowledge could weigh in on this; it doesn’t seem possible to me). Dr. Louis J. Mitchell, the coroner’s physician, examined the body and declared that the internal organs indicated that it was a man, not a woman. One theory police came up with – when it was still thought to be a woman’s body – was that this was the body of “Alice,” a mystery corpse from 1889 whose story had been part of what was then called the Crime of the Century: a story recently, and thrillingly, told in Gillian O’Brien’s excellent new book, Blood Runs Green: The Murder That Transfixed Gilded Age Chicago. In May of 1889, Dr. Patrick Cronin disappeared. He’d been telling friends that he feared for his life; his work to expose corruption in Irish American rebel societies had made him some very powerful enemies. When he disappeared, opinions flew throughout the city. Some said he’d been murdered, others that he’d fled to Canada or Britain for any number of reasons. 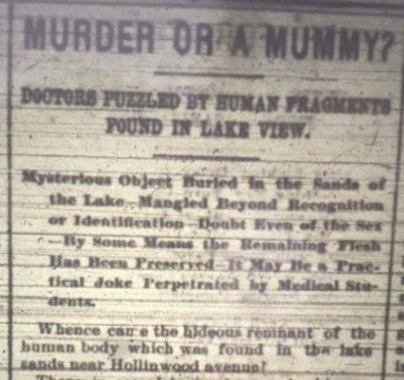 During the early investigations, police had followed men carrying a trunk in a cart who ran off down Diversey and Fullerton to the Lake and refused to stop when told to, and when a bloody trunk was found, it was thought that perhaps they’d dumped Dr. Cronin’s body in the lake. However, a young horse thief named Woodruff claimed that he’d been involved in moving the trunk, and that it had contained the mutilated body of a woman that the others called “Alice” (some sources say “Allie”), and that he was under the impression that she was a young woman who died during an abortion performed by Dr. Cronin, who had fled the country when she didn’t survive the operation. Police briefly connected her to a missing girl named Alice Villavose. They dragged the pond in Lincoln Park for her body, but came up empty. All I could find about Alice V. was a few notes in out-of-town papers saying she’d turned out to be alive. In time, Dr. Cronin’s beaten and murdered (but not mutilated) body was found in sewer in Evanston. The resulting trial was the longest in U.S. history at the time, and the story of Woodruff and “Alice” was mostly forgotten. Most probably determined that there had never really been a woman in the trunk at all. Until that one day in 1893, when police wondered if maybe “Alice” had been real after all. 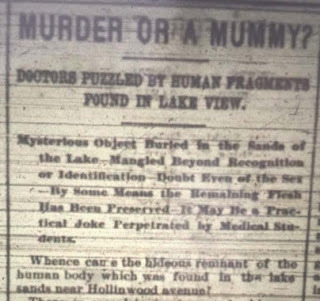 Given the timeline – the body was found right as the World’s Fair was opening – it’s almost remarkable that no one brought the story up again two years later, when papers briefly tried to blame every murder that had ever happened on H.H. Holmes. Mutilating and preserving a body sounds like the sort of thing you hear about him doing, though it’s more the sort of thing he was said to do in tabloids and pulps than what he actually did.